This is a new full concert size ukulele out of the Pohaku workshop. 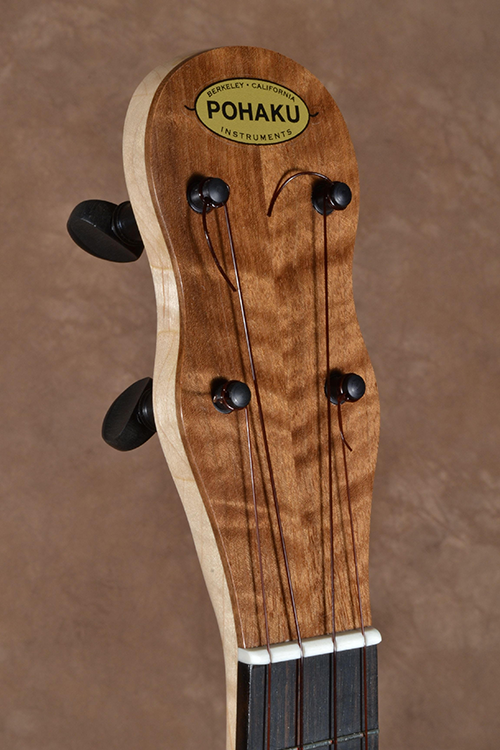 It is a curly California (Claro) Walnut body with a fine Honduran Mahogany top hidden underneath the olive tinted lacquer finish. The neck is Curly Western Big Leaf Maple and the fretboard a fine black piece of ebony with matching olive green martini fret markers. The sound is bright big and very ringy. The intonation and set up are excellent and tuning is easy with the peg head planetary geared tuners. The looks shine with a super smooth gloss lacquer finish and the back has the bowl like curve that all Pohaku instruments have. I have made a few instruments before with this combination of Claro Walnut mated with a olive colored top and I like them. People seem to like them too. The Walnut has enough of a greenish hue to make this an agreeable mix of color tones. The instrument has an overall length of about 23 1/2” and weighs about 19 ozs.